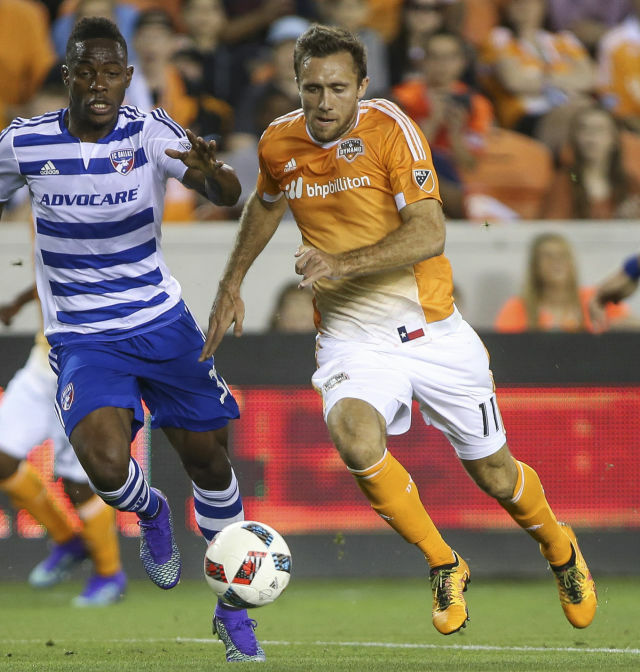 Each summer, thousands of Houstonians flock to BBVA Compass Stadium to watch some of the best professional soccer players in the country duke it out for glory on the pitch. It’s easy to get wrapped up in all of the high-flying, body checking, power kicking excitement, but it also made me wonder what goes into the training of these finely tuned athletes. I sat down with some of the players from the Houston Dynamo and Houston Dash to pick their brains on fitness routines that they love (and hate!) as well as their tricks for staying healthy. As it turns out, you might be sweating next to one of these pros in your next yoga or spin class. 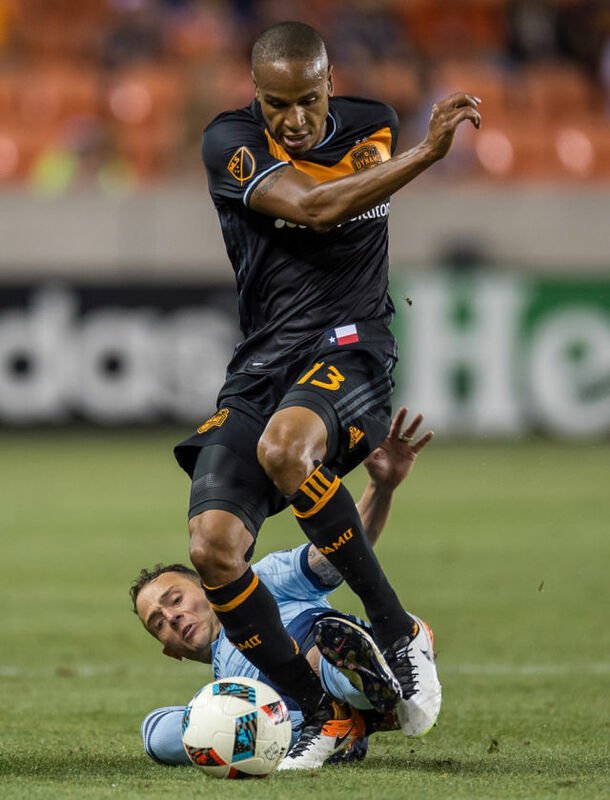 Ricardo Clark in a Dynamo game against Sporting KC. Favorite off-duty workouts: Ricardo is a big fan of tai chi and yoga, which he discovered in 2006. Now he incorporates these practices into a one-hour routine that he does each morning. 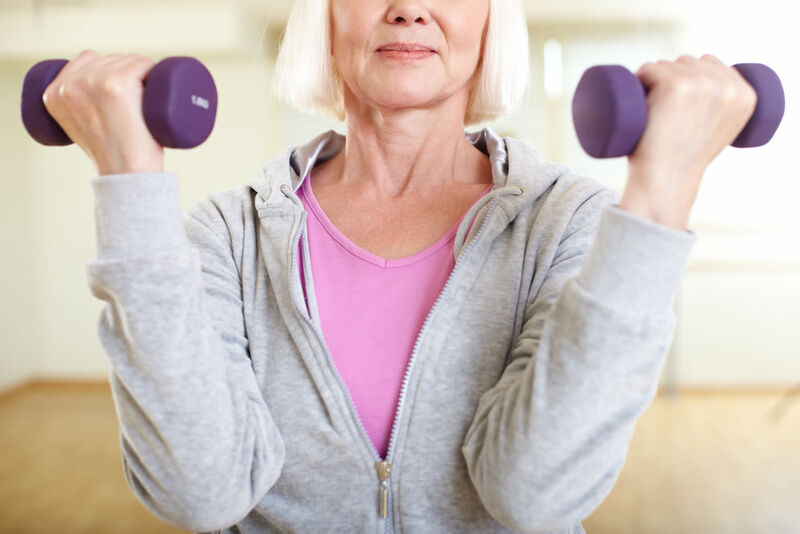 “It’s great for flexibility, concentration, and overall endurance,” says Clark. Helping foster his kids’ love of sports also keeps him on his toes—his son loves soccer and tae kwon do, while his daughter prefers dance and basketball. How to stay injury-free: Early in his career Clark struggled with ankle sprains, so now he uses strength and balance workouts to keep his supportive leg muscles strong. Among these are one-legged squats, four-way ankle drills with a cable column, and balancing exercises using a bosu ball. What would be your personal workout hell? Do you have a Golden Rule when it comes to fitness? 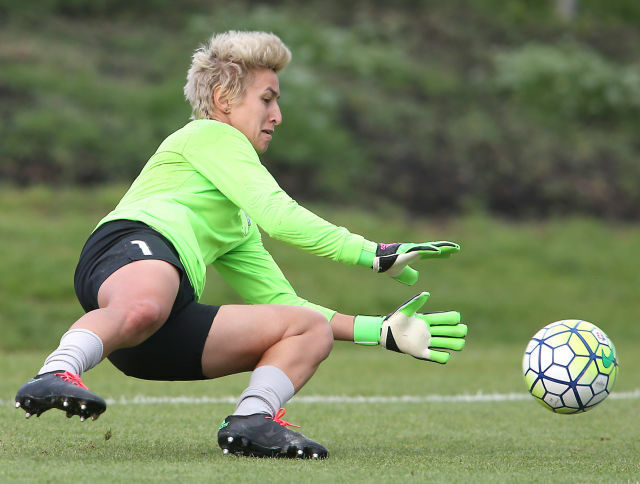 Bianca Henninger in a Dash game against the Washington Spirit. Andrew Wenger faces off against FC Dallas. Favorite off-duty workouts? “I like the camaraderie and atmosphere of SoulCycle, even though it doesn’t help me on the soccer field...at all,” laughs Wenger. He also likes to run and play squash or tennis on his days off, or during the offseason. Cari Roccaro in a game against the Washington Spirit. 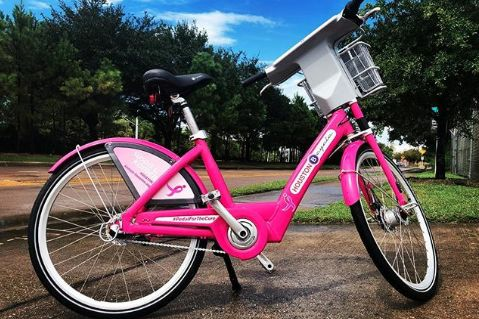 What are your favorite off-duty workouts? 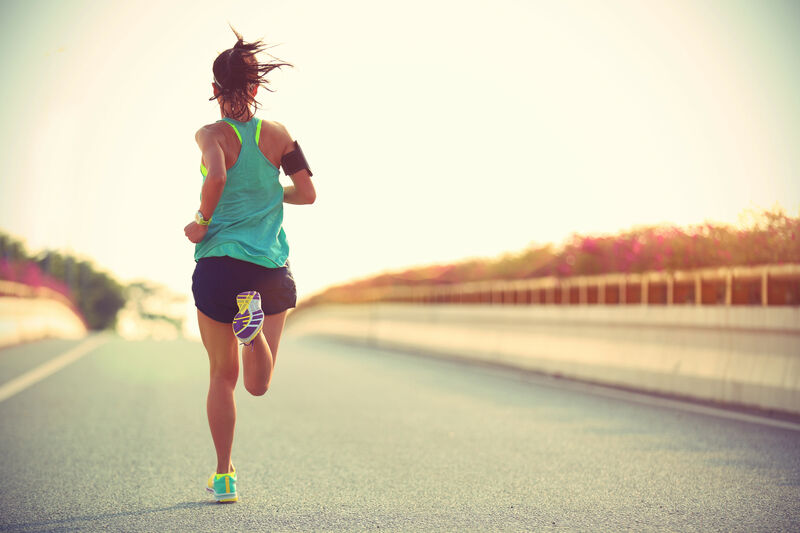 “I’ll probably regret saying this, but I actually like [interval] sprints and 20 meter beep tests.” A beep test is a fitness measurement consisting of two sets of cones 20 meters apart. Athletes are required to run from one set of cones to the other before the next beep, with each round getting increasingly faster. How to stay injury-free: Roccaro recently had surgery to repair a tear in her hip labrum, and is currently far ahead of her rehabilitation schedule. She credits her strong recovery to a rigorous routine of yoga, running and lower body exercises that were intended to strengthen her surrounding hip muscles as much as possible in the month leading up to the surgery. As part of her ongoing training, she is focusing on doing more hip and glute exercises using elastic exercise bands and weights. 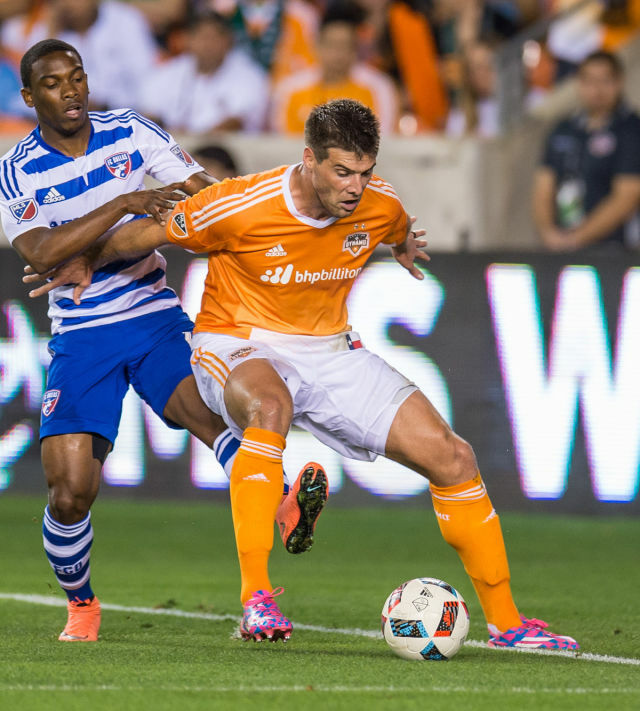 David Horst fights off a player from FC Dallas. How do you fuel up for a big game? 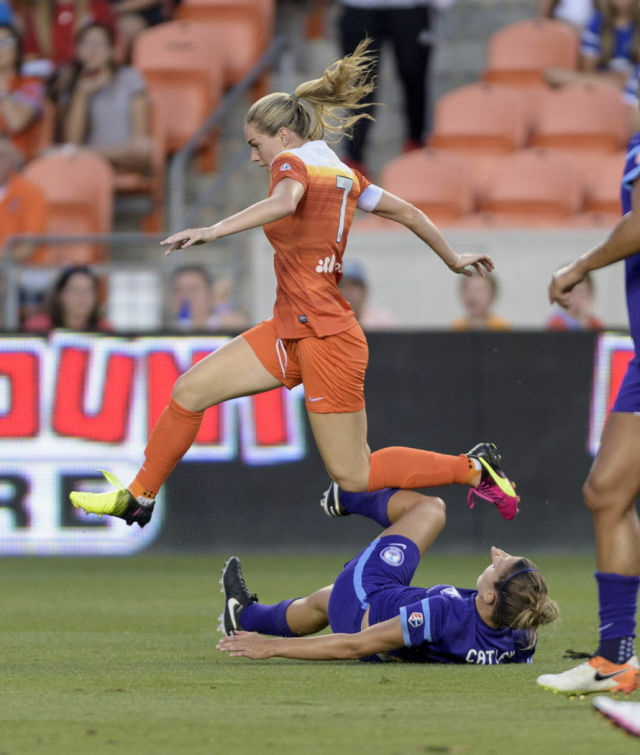 Kealia Ohai leaps past players from Orlando Pride. Favorite off-duty workouts: During the offseason Ohai likes to catch a yoga class or work with the trainers at the IX Innovations gym. “Squats and lower body workouts in general are my favorite things to work on. And abs!” In her spare time, she also helps her older sister make instructional fitness videos for her blog. How to stay injury-free: Although the Dash do their share of weightlifting to maintain their basic conditioning, Ohai also likes to add extra body weight exercises and elastic band work in order to protect her knees from injury. The Houston Dynamo’s next home game is scheduled for June 29th. 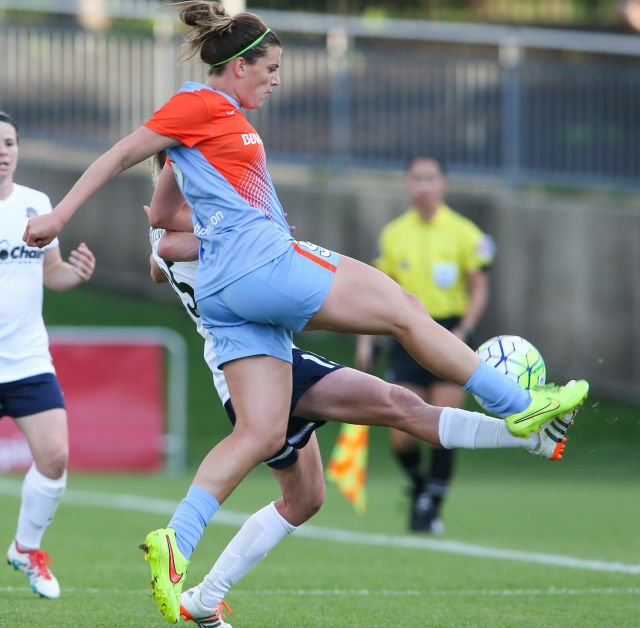 The Houston Dash’s next home game is scheduled for July 16th.